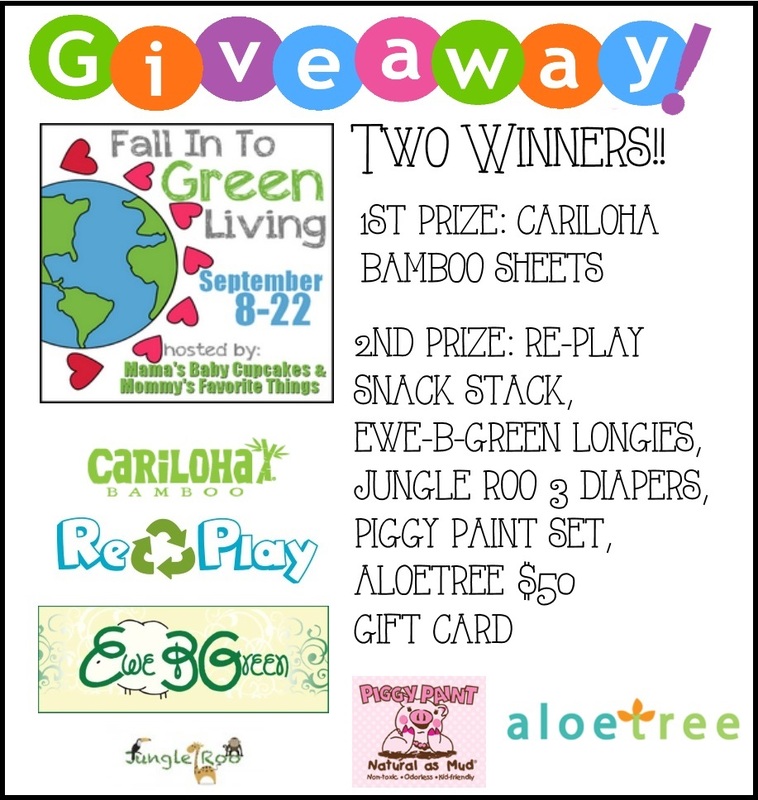 Welcome to the "Fall In To Green Living" Giveaway Hop hosted by Heather from Mommy's Favorite Things and Michelle from Mama's Baby Cupcakes. This hop is focused on items that are green/natural! Each blog has a minimum prize package of $25 per winner and after visiting my giveaway, make sure you use the linky below to take a look at the other blogs to see what they have to offer for you! Mommy's Favorite Things is hosting the Grand Prize for this one!! And we have 2 packages up for grabs! We have the Adult package which is for Cariloha and they are offering a Bamboo Sheet set of Choice. For the Kids Prize package we have LOTS of wonderful sponsors!! 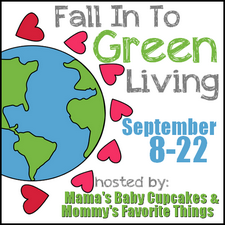 Mommy's Favorite Things, Mama's Baby Cupcakes and the Fall in to Green Living Participating Bloggers are not responsible for a sponsor who does not fulfill the prize specified. I like the sage colored sheets. I like the tan sheets. I would probably choose the sage set. I am most looking forward to the Aloetree Gift Card if I win. Thanks for the chance! i like the white sheets. i love the sage sheets. our sons name is sage and we are kind of obsessed with the colour. I love the color blue or I also like the sage color. I would love to win the Aloetree gift card,i have such fun picking what i want and also getting to browse. I would probably go with blue though I love white sheets too. Thank you! I would like the tan. Thanks so much. Love the diapers and the bamboo sheets! Thanks so much!!! Love the sage colored sheets! Thanks! I might choose the Blue sheets! I would choose the sage. i would love the aloetree giftcard! I particularly like the sage sheet set because it is a soothing color to me. I would choose the beautiful ivory bamboo sheets. I'm most excited about the Jungle Roo Diapers! I would choose the blue sheets! I'm most looking forward to the diapers. I'd like the blue sheet set! BTW there is no "Secret Code" for this hop by following the link in the rafflecopter! I'm excited about the Longies and the Piggy Paint! I like the blue sheets. most looking forward to the gift card! I am looking forward to the Aloe Tree Giftcard! :) Although, all the prizes are nice! I would choose white sheets! I am most excited about the diapers! I would choose the Sage sheets! 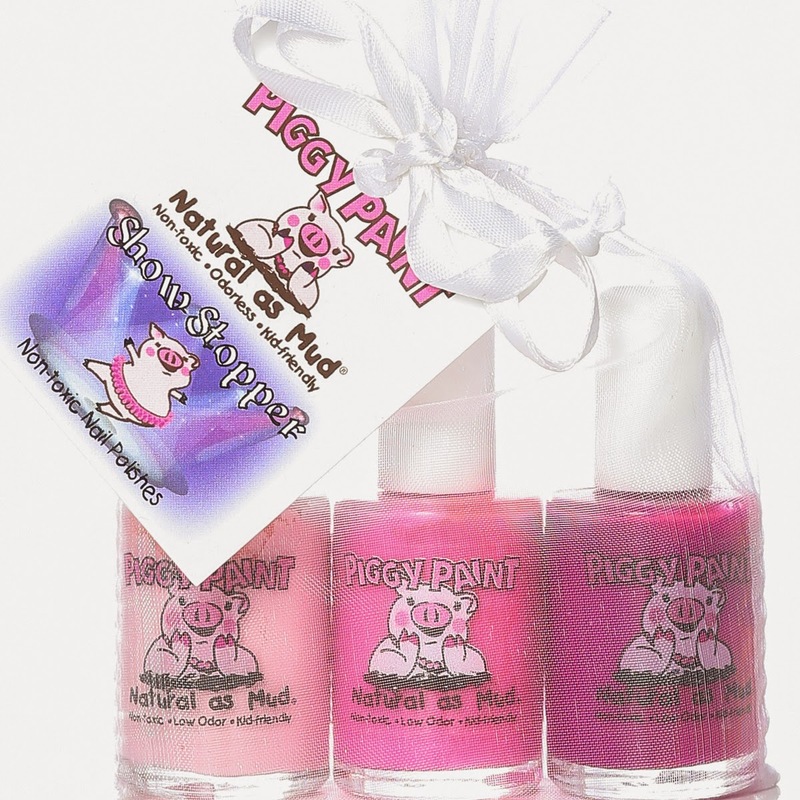 My daughter has started to show interest in having her nails painted so Id love to try the Piggy Paints! I would like either the blue or sage sheets. Thank you! I would get either the blue or tan sheets. I would probably choose the sage! I'm most looking forward to the longies! I love wool! I would choose the Ivory sheets. i love the longies the best!! I'd really enjoy those JungleRoo diapers! I would probably choose the tan sheets. I would choose the sage sheets. I am most looking forward to the Jungle Roos. I would pick the blue set!! I'm looking forward to winning the diapers. I really love white sheets so I'd get those. I really like the tan color sheets. I would be really excited to get an Aloetree kids gift card and to get the piggy paints! Most excited about the Jungle Roos. And I like the sheets in sage. I am most excited that Jungle Roo is offering 3 cloth diapers. I would love to win these! I am most excited about the jungle roo diapers! I would love to win the Jungle roo diapers! The 3 diapers from jungle roos! I'd love the cloth diapers and piggy paint. I'm most excited about the longies!!! we love wool in our house! Id love the blue sheets!! I'm looking forwards to the Aloetree kids giftcard. I would choose the Blue sheets. I am looking forward to the Aloetree Kids $50 Gift Card. 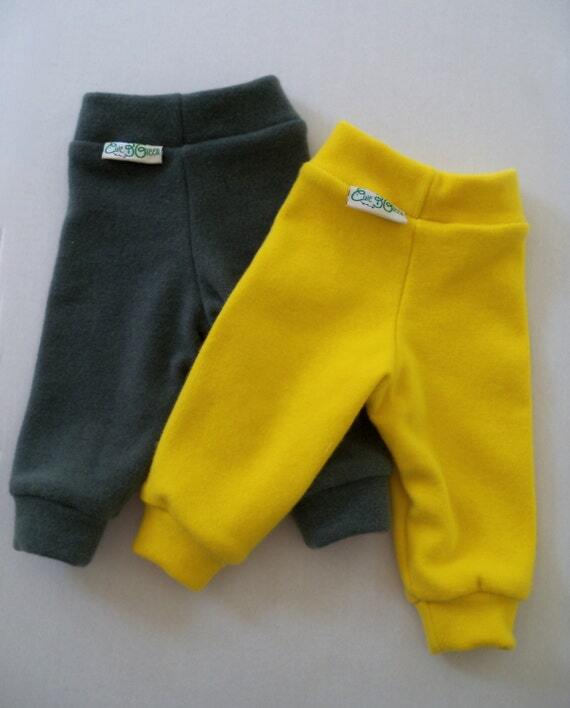 I love the wool pants from EweBGreen! THeir Etsy page has some great stuff too. I love the bamboo racer tank in Jade, and the cloth diapers are super sweet . If I won the giveaway I would choose the queen sized sheets in sage. I would chose the tan color. This would match my bedding. I think I'd get the tan sheets although the blue might look nice, too! I'm most looking forward to the longies! Blue sheets look really nice. I'm most looking forward to the wool longies. I think I would like the Tan set of sheets. I'd like to win the diapers. I would pick the sage color for the sheets and in the second giveaway I'm most looking forward to winning the Jungleroo diapers. Thanks! Just a heads up...on the option that says click here to watch a video...it takes you to a page that isn't working. I am most excited about the wool longies! I'm most looking forward to winning the set of 3 diapers! The prize I am most excited about is the Piggy Paint! For the sheets giveaway I would choose the color blue. For the multiple prize giveaway I'm excited for the jungle roo diapers! I look forward to winning the Piggy Paint. I think I would choose the ivory sheets! I would choose the sage Green sheet set for our master bedroom. I would choose the Sage sheets. They will match my comforter perfectly. I like the sage color the best. Thank you, Paula C.
If I were to win I'd love to get the color blue. It's my favorite shade. I might choose the blue sheets. The sage colored sheets would look beautiful on my bed. I would choose tan sheets. I love the blue color of sheets!